GNLD Nutritional Antioxidant Vitamin Supplement product Chewable All-C has loads of Vitamin C and is necessary for the maintenance of the immune system. This product is chewable and perfect for your children. The Vitamin C tablets can be taken as needed. 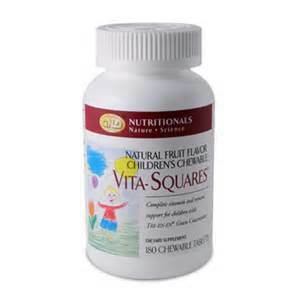 Delicious cherry-flavored GNLD Anitoxidant All-C is great and one of the best Vitamin and multivitamin for your Kids' health or anyone who prefers chewable tablets. You can take them throughout the day to maintain high vitamin C levels, or take a tablet whenever you want the vitamin C value of 4 small oranges. GNLD Nutritional Antioxidant Vitamin Supplement product-Chewable Vitamin C tablet contains, sucrose, glucose, fructose, magnesium stearate, silicon dioxide, natural and artificial flavors and natural color. Why is GNLD Nutritional Chewable All-C Antioxidant Vitamin Supplement product the best for you and your Kids' health? High-potency, high-purity Vitamin C and Vitamin C- related factors from oranges, lemons, and grapefruit enhance bioavailability. 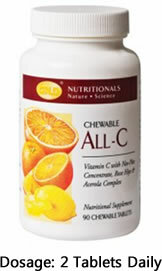 All-C also contains rose hips and acerola cherries - nature's richest Vitamin C sources! GNLD's exclusive Neo-Plex Concentrate provides virtually everything from whole oranges except the water: juice factors (Vitamin C, bioflavonoids, etc.) and rind and pulp factors (including flavedo, mesocarp, endocarp, and protopectins). Two potencies, two forms. Available as chewable tablets or Vitamin C Sustained Release tablets mainly for Adults that can swallow. Chewable All-C helps protect body fluids and the watery portions of cells from free-radical damage linked to cardiovascular disease, cancer, cataracts, declining immunity, and premature aging. It helps in the formulation of collagen, the major protein of connective tissue, cartilage, and bone. 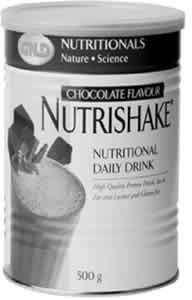 It helps in hormone synthesis as it relates as it relates to body's stress response.